A pivotal NASA authorization act passed Thursday by a U.S. Senate committee directs the space agency to fly an extra space shuttle mission next year and immediately start developing a heavy-lift rocket to send humans to an asteroid and Mars. It also cuts in half the White House's requested funding for commercial human space transportation over the next three years. The bill significantly modifies many of the Obama administration's proposals under the White House's fiscal year 2011 budget request, but it still requires approval of the full Senate and President Obama and reconciliation with legislation from the House of Representatives. The White House expressed support for the authorization act in a statement released Thursday evening. "The bill contains the critical elements necessary for achieving the president's vision for NASA, it recognizes that Constellation is no longer the right program for achieving our boldest ambitions, it helps launch a commercial space transportation industry, it embraces the President's proposal for an additional $6 billion for NASA, it extends the International Space Station and it represents an important first step towards helping us achieve the key goals the president laid out," the White House statement said. The Senate Committee on Commerce, Science and Transportation unanimously approved their version of the NASA Authorization Act of 2010 on Thursday morning. The bill is the first time Congress has officially weighed in on NASA since the White House's proposed shake-up of the agency. "It's somewhat of a miracle that we have been able to achieve the unanimity in this consensus," said Sen. Bill Nelson, D-Fla., one of the chief architects of the bill. The Senate's appropriations subcommittee overseeing NASA could begin its budgeting process as soon as next week. The subcommittee is chaired by Sen. Barbara Mikulski, D-Md. "Sometimes the divide between authorizers and the appropriators is bigger than the party divide," said Sen. David Vitter, R-La. "There's no divide here." Lawmakers said the Senate Commerce Committee worked with appropriators throughout the authorization process. Sen. Richard Shelby, R-Ala., is the appropriations subcommittee's Republican ranking member. Shelby has been a vocal opponent of Obama's NASA plans. "This proposed authorization bill provides a significant new direction for NASA," Shelby said in a statement. "It wisely rejects the administration's outright cancellation of NASA's human space flight program, and instead provides a clear path forward for the agency's exploration program. While this authorization bill is a good first step in the legislative process, it is important to note that the Appropriations Committee will determine the ultimate outcome." The authorization act passed Thursday provides for the launch of an extra shuttle flight sometime next summer, pending a review of safety concerns. The flight, designated STS-135, would keep much of the shuttle workforce in place for another year and resupply the International Space Station. 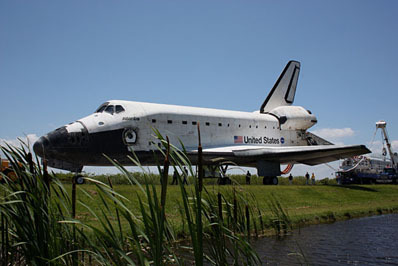 NASA currently plans two more shuttle flights launching in November and February. Workers are preparing equipment for a third mission that would fly as a rescue if the two scheduled shuttle flights experienced problems. The STS-135 flight would use the existing hardware if a rescue mission is not required. "The bill that [we] put out of committee today does preserve our workforce, our creativity, and the commitment to humans in space," said Sen. Kay Bailey Hutchison, R-Texas, the Republican ranking member on the Senate Commerce Committee. "It will allow us to fully utilize the space station." A heavy-lift rocket and human-rated deep space capsule, collectively called the Space Launch System, is also part of the Senate bill. The authorization act would move up the rocket's development to fiscal year 2011, which begins in October. The government-owned booster and manned spacecraft should lift between 70 and 100 tons to space, according to the current version of the bill. The legislation requires NASA to use existing contracts, workers and capabilities from the space shuttle, Orion and Ares 1 programs. 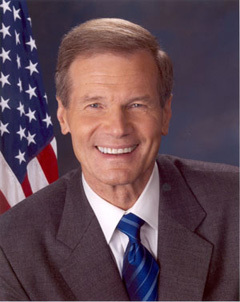 "The committee cannot tell NASA how to design a rocket, but we can give policy direction to the executive branch of government, and we've done that in the bill, utilizing shuttle-derived technology, building on that, making it evolvable, not building the largest rocket around, but starting in the range of 75 to 100 metric tons," Nelson said. Under the White House budget proposal released in February, NASA would stop work on the Orion and Ares rocket projects with the cancellation of the Constellation program, which was tasked with resuming human exploration of the moon. In a major space policy speech April 15, President Obama announced his intentation to reinstate the Orion capsule for limited lifeboat duties at the International Space Station and identified asteroids and Mars as the ultimate destinations for the human space program. Obama also promised to start developing a heavy-lift rocket by 2015 for the asteroid and Mars missions, which would occur in the 2020s and 2030s. The Senate authorization bill keeps the asteroid and Mars goals for NASA, but it accelerates the timeline. Instead of picking a design and beginning development by 2015, the legislation sets a deadline for the shuttle-derived heavy-lift rocket and manned spacecraft to be fully operational by Dec. 31, 2016. "That's what we've done in setting the policy in this bill," Nelson said. "We're starting earlier." The Constellation progam was aiming to start human flights by 2014, but independent reviews showed chronic underfunding would push the first operational launch to at least 2017. According to Nelson, it will cost $11.5 billion to design and build the new heavy-lift rocket in the next six years. "That is doable," Nelson said in a press conference Thursday. But lawmakers acknowledged it is difficult to predict whether the program would receive necessary funding to ensure it does not have the same fate as Constellation. NASA would still turn over crew transportation to low Earth orbit to private companies under the authorization bill, but the Senate committee's legislation would reduce the agency's proposed funding for commercial crew programs. The White House budget provides for $3.3 billion over the next three years, enough to procure multiple providers to ferry astronauts to the International Space Station. The Senate's authorization act would reduce the funding to $1.6 billion through 2013. The authorization act also directs NASA not to start commercial crew procurement until at least 2012. 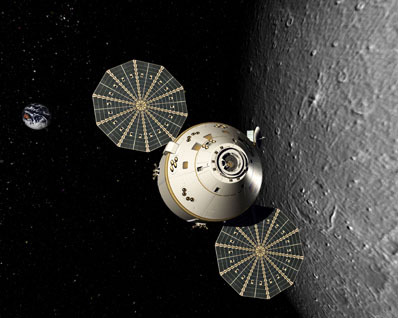 Artist's concept of an Orion spacecraft orbiting the moon. Credit: Lockheed Martin Corp.
Hutchison said she was concerned about giving commercial providers too big of a role. "I am also concerned that we work constructively with commercial space operators, but not turn over the entire NASA program to as yet untested companies that would not have the expertise that we have built in NASA through the years," Hutchison said. "I think we have created a balance in which commercial is going to be very important." Hutchison advocates using commercial space transportation in a "transitional way." Sen. Barbara Boxer, D-Calif., and several other lawmakers announced their support for commercial providers, vowing to continue fighting for more funding. "As we move to the floor, I'm going to be teaming up with some colleagues who would like to see a little more done on the commercial side, so we'll all work together and maybe we can get that done," Boxer said in the committee's markup session Thursday morning. Sen. Mark Warner, D-Va., also requested more NASA funding for commercial human spaceflight. California and Virginia are the home states of SpaceX and Orbital Sciences Corp., two leading commercial contenders to carry astronauts to the space station. SpaceX and Orbital already have contracts to deliver cargo to the outpost beginning next year. The heavy-lift rocket program would save 2,000 jobs at the Kennedy Space Center, and commercial crew launches would generate another 1,000 jobs along the Space Coast, according to Nelson. Other centers in Houston and Alabama would also see job relief. "The transition down will be much more gentle," Nelson said. "And the increase of the jobs will be much more accelerated."